The other day, I shared that we are in the midst of discerning schooling specifics for Therese. We've actually made great strides, and I think we've about got it all figured out for next year. I'll share it all with you once we do, because I think that there are probably other parents in our shoes, and it would be helpful to hear our schooling plans! I think what I've been struggling with the most, though, is trying to find my tribe. In the case of schooling, I feel that, in some ways, I can relate the most to the homeschooling mindset. I think this is especially true when it comes to the nitty gritty of specific curriculum and overall educational mindset. In other ways, I find myself feeling most at home in a traditional school setting, mainly because I had a positive experience with traditional school (both Catholic and public), and I feel nostalgic when I remember my own schooling. Of course, there's a lot more that has gone into our schooling discernment - since we are making the right schooling choice for our daughter, we obviously have to take into account who she is and what her needs are. But in the midst of all of this, I've found myself wondering...who do I belong with? I don't really 100% fit the mindset of either of those groups, you know? I've been taken this - pretty seriously - to prayer. And, little by little, I think God is making it clear what direction our family is being called in for next year. But there's something I'm realizing. It's important to have a solid support group around you and your family. It would be nice if your most inner circle consisted of people who wholeheartedly agreed with every choice you made. But life simply isn't like that. And people aren't like that. They aren't so black and white and clear cut. Some of my dearest friends are people who have made decisions that are very different than mine, for themselves and for their families. But each of those people plays a significant role in my life. God works through each of them, even when we don't see eye to eye. Ultimately, I'm realizing that I just won't find my "perfect tribe" here on earth. I won't really feel that I 100% belong anywhere until I am finally home (in heaven). But realizing that helps me to relax, and to be more open to the ways that God is helping me find people I can relate to. Andrew's Ph.D class consists of five guys (including himself, and no, they don't own their own burger place). In that group, one other guys is Catholic, one is Greek Orthodox, one is from a Baptist tradition, and the last one is Presbyterian. All of them are married, and most have children. It is a really diverse group, but they are some of the most phenomenal people we have ever met. I love their wives, Andrew gets along with his classmates, and their children are adorable. Out of this very diverse group, we have all formed a common bond - the bond of wanting to get through this doctoral program, and of wanting to support these men in getting their degrees so that they can use those degrees to spread the Gospel, each in his own way. I will always look back at these five years of our marriage with gratitude for these people we have walked alongside. Despite the fact that we live in a fallen world, full of division, there are these glimmers of hope. There are moments and encounters in which we find unity, even where it seems there should be division. These are marks of the Holy Spirit at work. We are, all of us, in need of the Holy Spirit. He gives us the grace we need to seek and find unity with each other, and to be less judgmental of one another. I struggle so much with being judgmental, but it is mainly because I feel insecure myself! And, I'm guessing that I'm not alone in this. In the Liturgy of the Hours this week, the antiphons, prayers, and Scripture readings this week are all pointing to one thing - Pentecost. They are filled with pleadings for the gift (and gifts!) 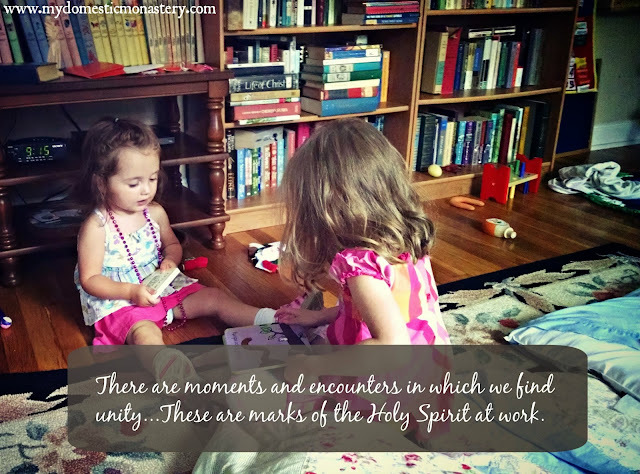 of the Holy Spirit. While I've been trying so desperately to find the place where I belong, I'm beginning to realize that it's less about where I belong and more about with whom I belong. If I follow on the coattails (figuratively speaking) of the Holy Spirit, I will somehow find my tribe. I think you've hit on some very important insights here. We naturally want to know and socialize with people to whom we relate, who can understand us, and who seem like us. However, we are individuals, and our families are unique. There is no group with whom we fit 100%, nor would it necessarily be healthiest for us spiritually. God leads us to know people who can help us grow--and whom we can help, too. It's crucial to stay close to the Holy Spirit, to discern His inspiration for where we should be at this particular time in life, and to be open to growth. I think that when we do that, and loosen our grip so to speak, our "tribe" actually finds us, instead of us finding it.